Are you thinking about roofing your pool or about the reasons that made our customers to get roofing of their pools? You will extend the swimming season up to 150 % (from 2 to 5 months) – by naturally increasing the pool water temperature. You will increase the purity of the pool. You will significantly reduce dustiness, airborne dust and debris fallen into the pool. You will save for chemicals used for maintenance and water purity. It does not rain in the pool. Acid rain water is full of impurities and significantly promotes algae growth and biofouling. Roofing can easily be opened completely. The roofing does not take the view and does not interfere with swimming in the summer. 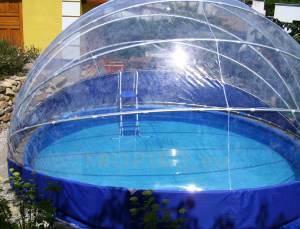 On hot summer days the complete opening can interrupt “overheating“of the pool water and the air above the surface. With a simple installation of our roofing you will save additional funds. You can perform installation yourself.